Busy weekend for us with finishing the updates to issue #7 of Lloyd and the Bear! 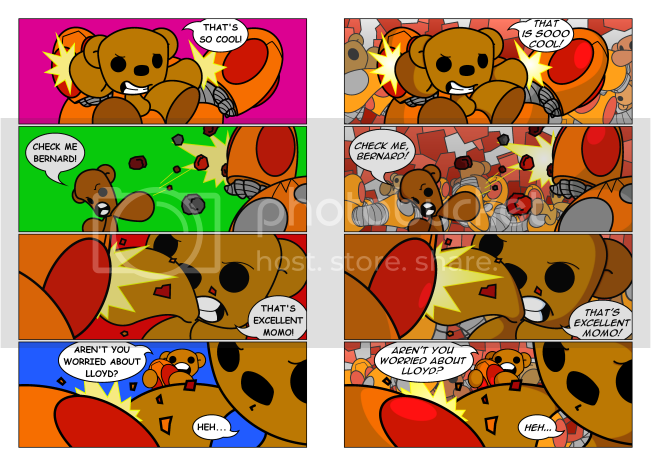 As with the previous books I’ve been busy changing the font and while doing that adding a bit more colour to the pages. With issue #7 I realised I had a chance to go and add a bit more to the backgrounds in some scenes. Take this page for example! I realised that we have this huge fight scene and yet very few bears and robots (Bears & Robots sounds like an awesome title for a comic by the way!) can be seen so yeah, little bit of an update there! I’ll let you know when the book is out to buy at Comixology!